Butch Davis has been coaching football for 38 years of his life; yet, he still gets emotional when his seniors get ready to graduate. FIU’s head coach warmly regarded his senior class following the Panthers’ last home game of the season. “You know everything about [your players]—their lives, their moms, their dads, their grandparents, their family members that have passed away, their struggles and their dreams. To see them do what they did and go to their second bowl game in a row, it’s touching,” Davis said. 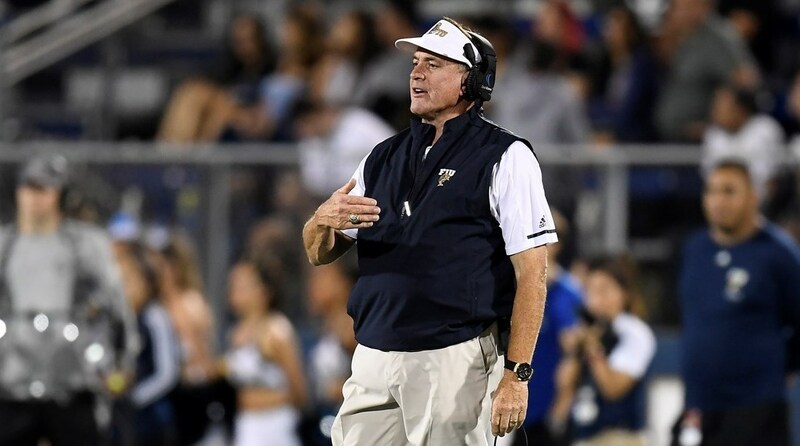 This year’s football team was the first to spend a full year with the second-year FIU coach. Last year’s senior class only had seven months with him. When asked about how his seniors contributed to this year’s season (8-4, 6-2 in Conference USA), Davis pointed to their work ethic. “I think the core of this senior class played a big role in the offseason conditioning program. You got to have guys who start in the weight room and say, ‘Watch me, watch how I work. And everybody around me, do what I do,’” Davis said. The football team is 16-9 during Davis’ tenure. For the seniors that have been around since 2015 and 2016, when the team earned a combined record of 9-15, it’s been a transformation worth being a part of. “Talking with some of the seniors, we look back and we say, ‘Wow, we thought we would never be here,’” said senior running back Napoleon Maxwell. FIU still has a bowl game to play—the Makers Wanted Bahamas Bowl on Dec. 21 versus Toledo. If the Panthers win, they will break their all-time record for wins in a season. The best coach in football should be coaching the U!